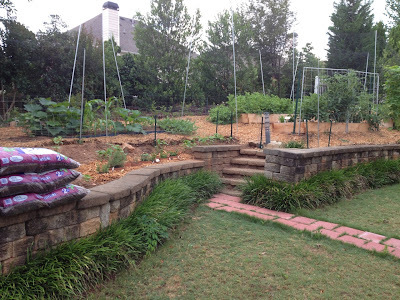 Steps have included research, planning, buildout, planting, maintaining, and harvesting. I started this year with research on food gardening. I read several books from the library, explored topics online, watched videos on YouTube, attended a local Master Gardeners meeting, and asked questions at several nurseries. This research was an important step in expanding my knowledge, exposing me to new ideas and food gardening philosophies, and becoming even more inspired and committed to achieving the goals I had set. 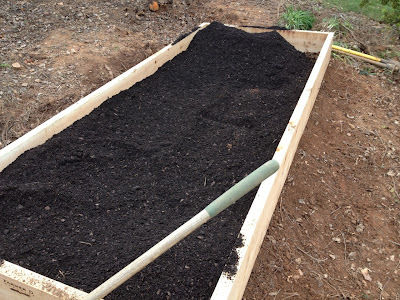 Using your own compost (to serve as your fertilizer going forward). These points resonated with me very well given my experience and learnings from last year. I decided to use several of the concepts from this book. GrowOrganic.com by Peaceful Valley. Here is the link to the web page of their videos: http://www.groworganic.com/organic-gardening/videos. I find these videos well-made, scripted, edited, the right length, and informative with topics for beginners and advanced gardeners. GrowingYourGreens.com. Here is the link to the videos on YouTube: http://www.youtube.com/user/growingyourgreens/videos. John Kohler has created 653 videos (as of this writing). These are unscripted and many are lengthy. I recommend the series for John's enthusiasm and his inspirational messages to get people to grow their own vegetables. The general recommendation for beginners is to start your garden small and slowly build out your garden over the seasons as you learn more about gardening, decide what and how much you want to plant, and determine how much time, money, and effort you want to put into your garden. We decided to "go big", do it right, and build a new garden. This requires a commitment of time and money as well as a resolve to keep it going for many years. 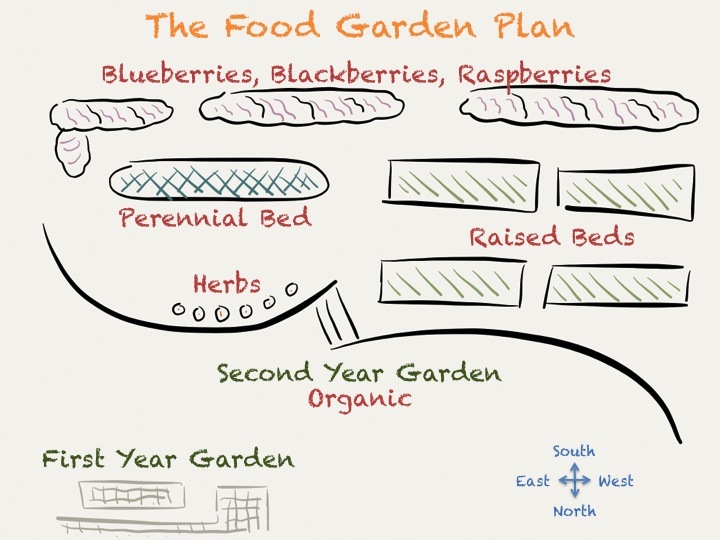 Below is a graphic depicting the plan of the new food garden. Last year's garden is shown in the lower left and was built up against the house. The second year garden is in the upper tier of the backyard. The two gardens are drawn roughly to scale, which gives you an idea of the size of the new gardening area. 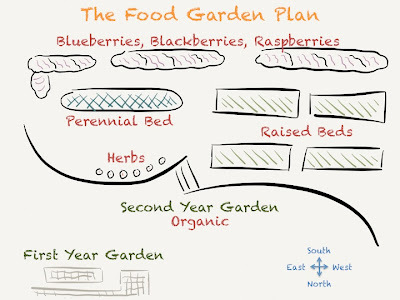 The new garden plan includes four raised beds, a perennial bed for multi-year plants, an herb garden, and a long row of blueberries, blackberries, and raspberries. Below is a photo of the upper tier of the backyard in February before the buildout of the garden. 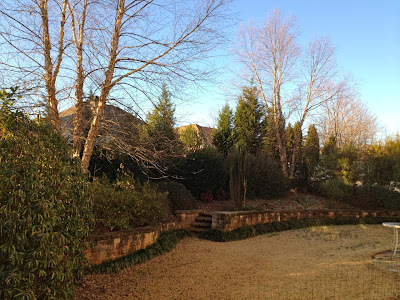 The two large birch trees needed to be removed to allow full sun on the garden. In addition, the roots of the tree on the left had already spread to the grass in the lower tier and was starting to push the retaining wall down. 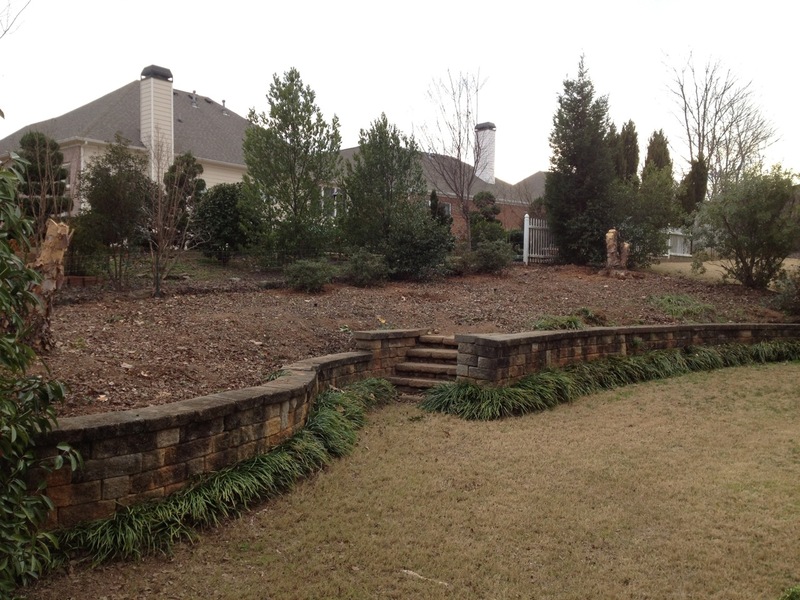 The trees and shrubs from the upper tier were removed. The size of the land for the garden can now be seen more clearly. The long side of the property line in the back is on the south side of the property and the retaining wall faces due north, giving the land a full east-to-west sun exposure. 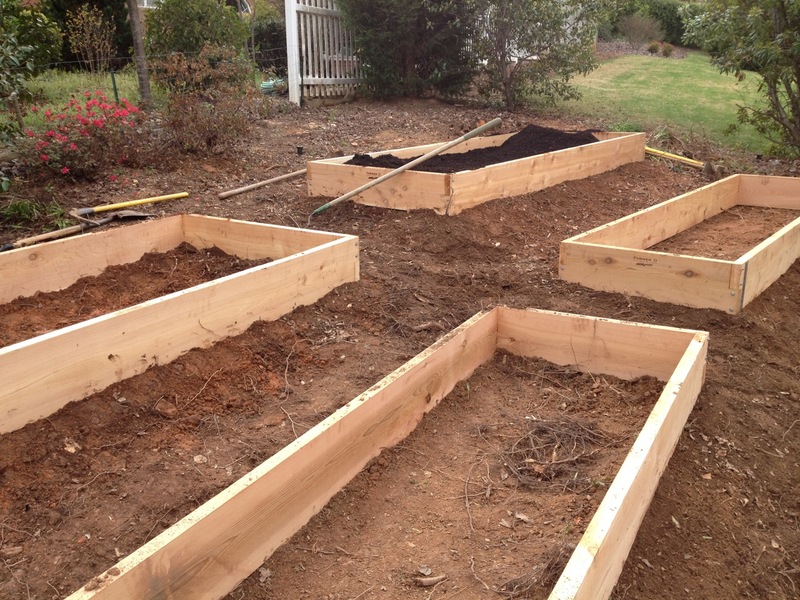 Four raised beds were installed on the west side of the garden. Two of the beds are 10 feet by 4 feet and the other two beds are 10 feet by 3 feet. All are ten inches deep. This provides 140 square feet of raised bed planting space. The wood is made from FSC certified western red cedar which is resistant to rot and insect damage. 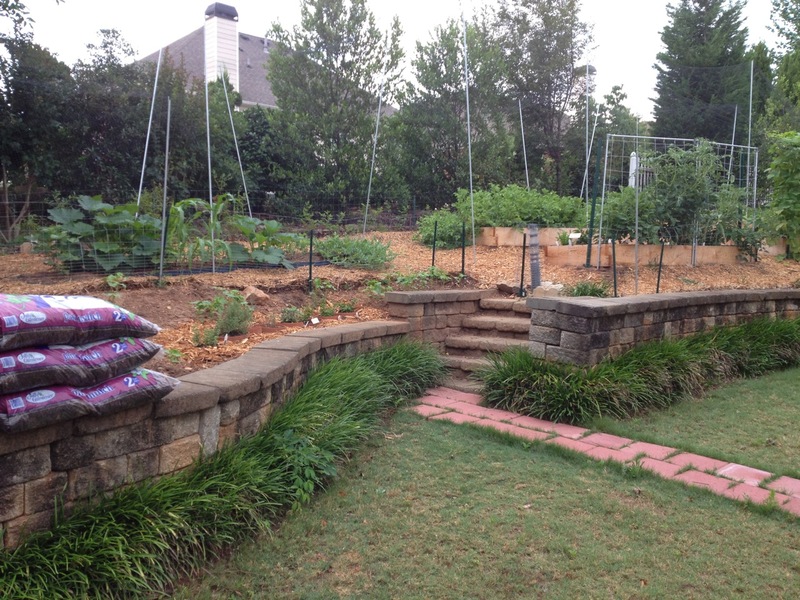 The raised beds were filled with premium organic soil and fertilizer. Notice the rich color and fluffiness of the new soil compared to the soil outside the raised bed. For Square Foot Gardening enthusiasts this is not the soil mix described in Mel's book, but it is an organic mix made by an Atlanta-based company called Farmer D Organics. 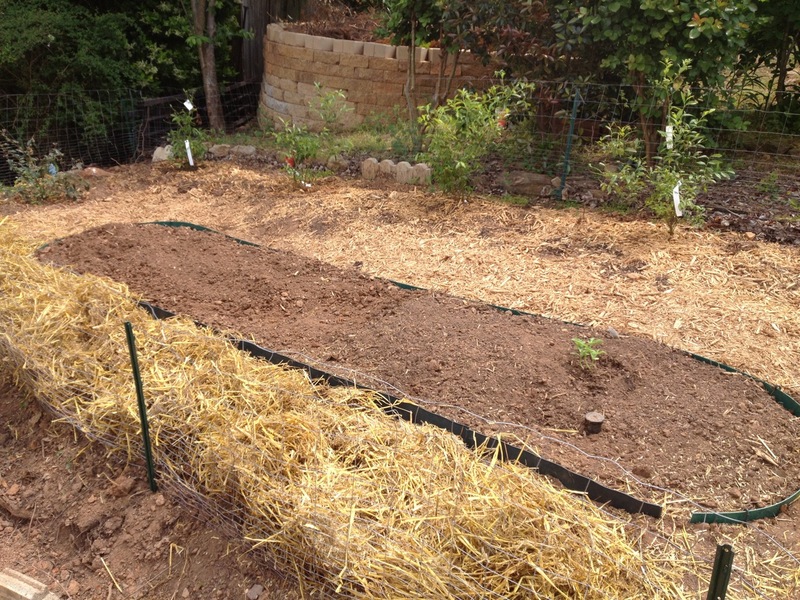 Drip irrigation was installed on the four beds. 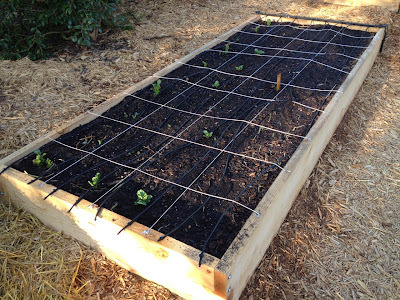 String was used to mark off the squares for the Square Foot Gardening method. Trellises were installed on the north side of two of these beds. 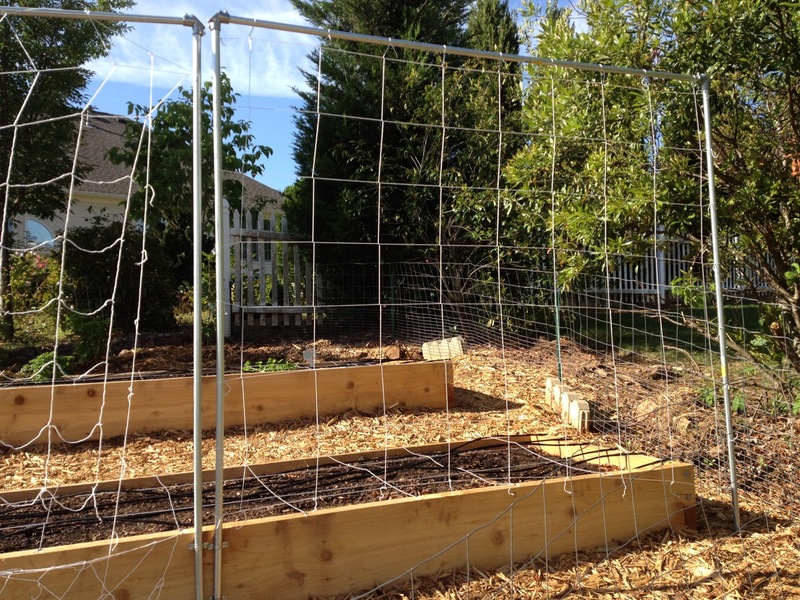 The trellises are made of electrical conduit and nylon trellis netting. A perennial bed was prepared. This bed is being used this summer as an annual bed to experiment with different plant techniques (for example, planting the "three sisters" of corn, pole beans, and squash together) and to produce some food for Plant a Row for the Hungry for the local food bank. Blueberries were planted behind the perennial bed. 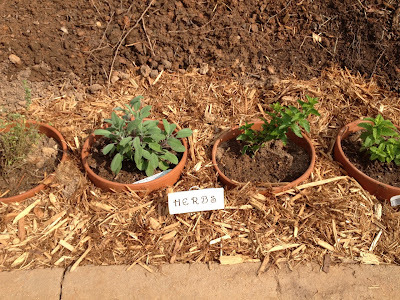 An herb garden was prepared by burying terracotta pots into the ground. The pots help keep the plants from spreading as several types of herbs, such as the mints on the right, are considered invasive. A rain barrel was installed on one of the downspouts of my home, and a second one was connected with a linking hose. These recycled food barrels were previously used to ship pickled food. Spigots at the bottom of the two rain barrels allow watering cans to be filled. The left one holds 55 gallons and the right one holds 50 gallons. 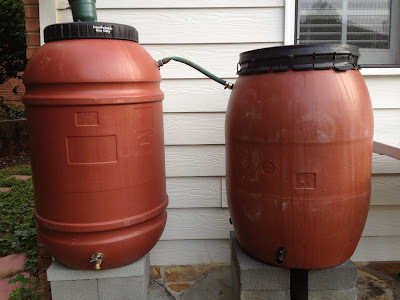 Both were filled with rainwater during the first major rainstorm after installation. A composter was assembled. This is a dual bin compost tumbler, each bin with a capacity of 50 gallons. 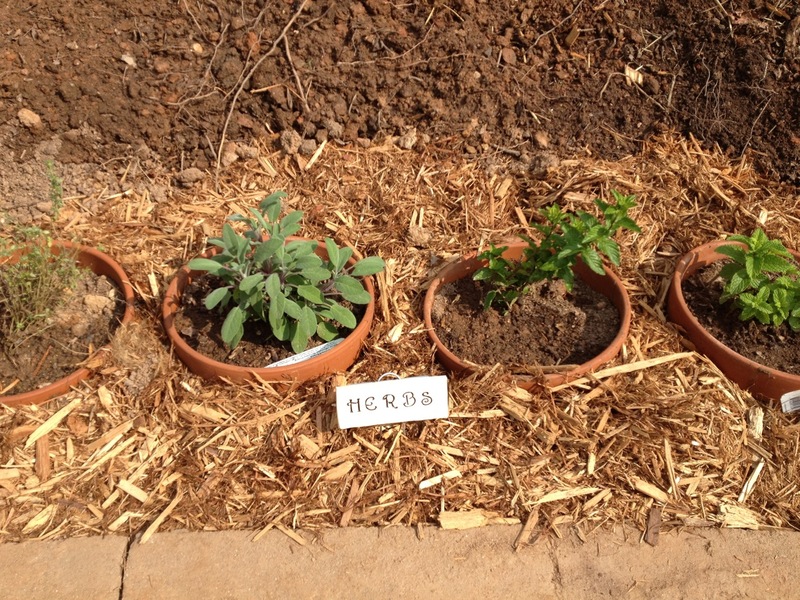 We began our plantings in the latter half of March. 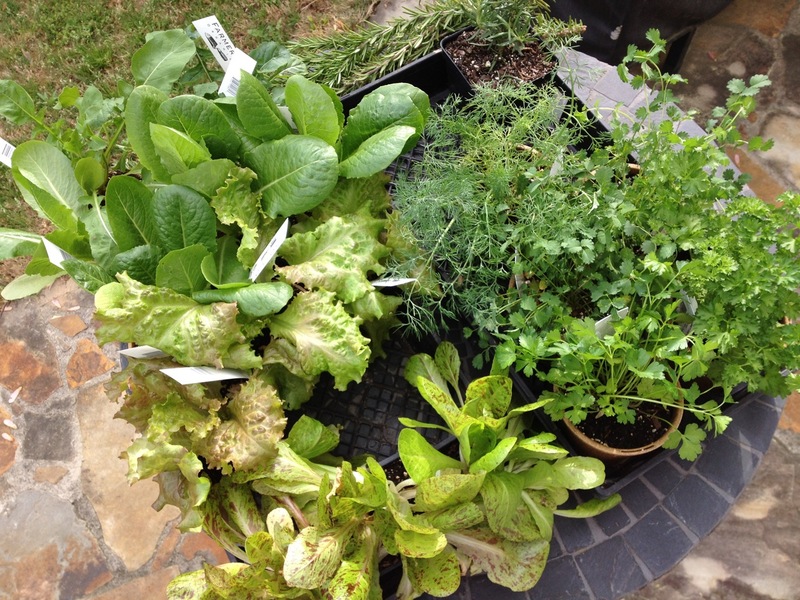 To get a head start on the lettuces and herbs, we purchased a number of these plants so we could harvest cuttings within a week of planting. 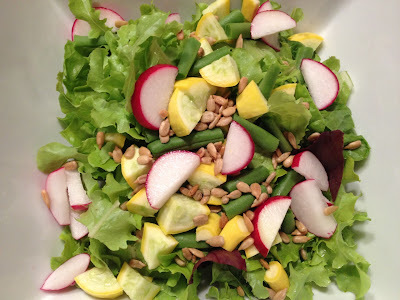 Lettuces included romaine, red leaf, arugula (also called rocket and technically considered an herb), and speckled trout back. 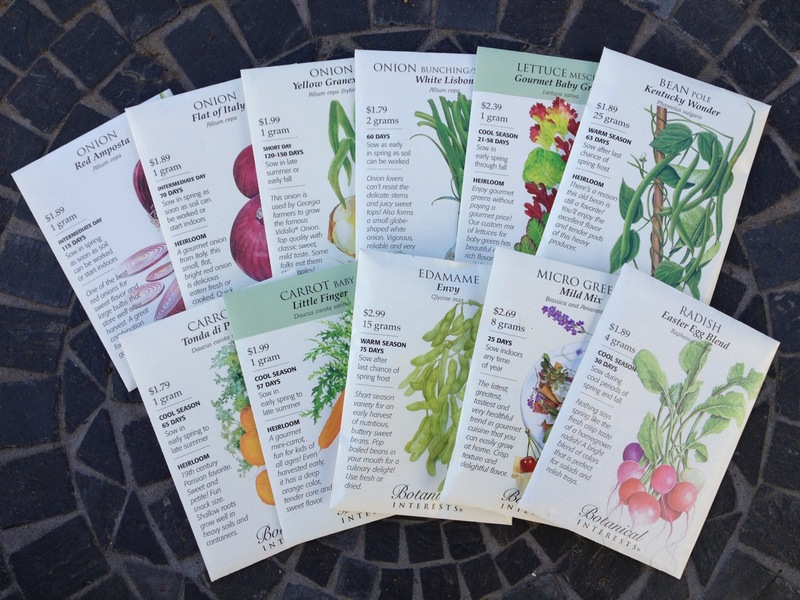 We also sowed seeds directly in the garden, beginning with seeds for cool season plants like radishes, carrots, and lettuces. After April 15 (considered the last frost date for this area), we sowed seeds for warm season plants like beans and edamame. We also planted potatoes. 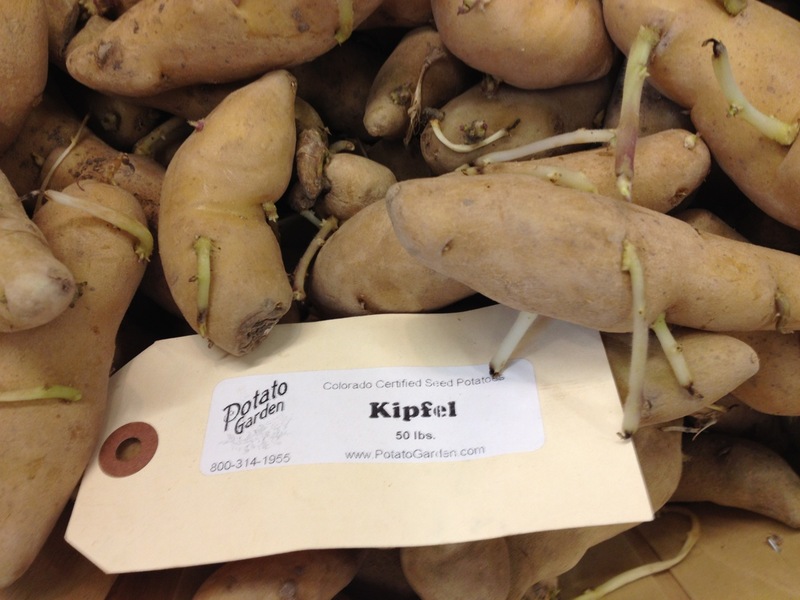 Potatoes are not grown from seeds but from seed potatoes. These seed potatoes were buried under several inches of soil. The plantings in each square of the raised beds were tracked. 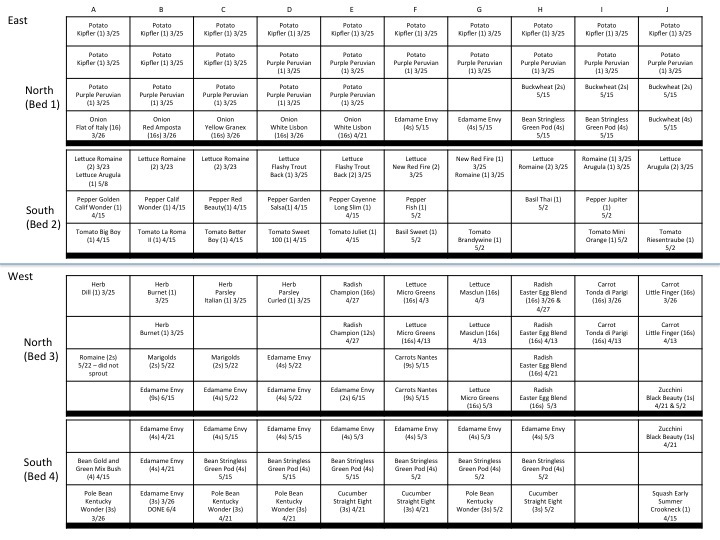 This diagram shows the plantings in the raised beds in mid-May. Maintenance has been a daily activity since the buildout and includes watering, pruning, weeding, pest control, and composting. Watering is particularly important to seeds until they sprout and to transplants until they adapt to the new environment and set roots. Pruning has mainly been performed on the tomato plants. Watering has been a combination of using the drip irrigation system for the raised beds, hand watering with water from the rain barrels, and rain from the sky. We have been fortunate this spring to have had several rain showers since March, limiting the number of times the other methods have been used. Weeding has been fairly easy to this point as there were no weed seeds in the soil placed in the raised beds. Weeds that have sprouted are easy to pull out because of the loose soil. 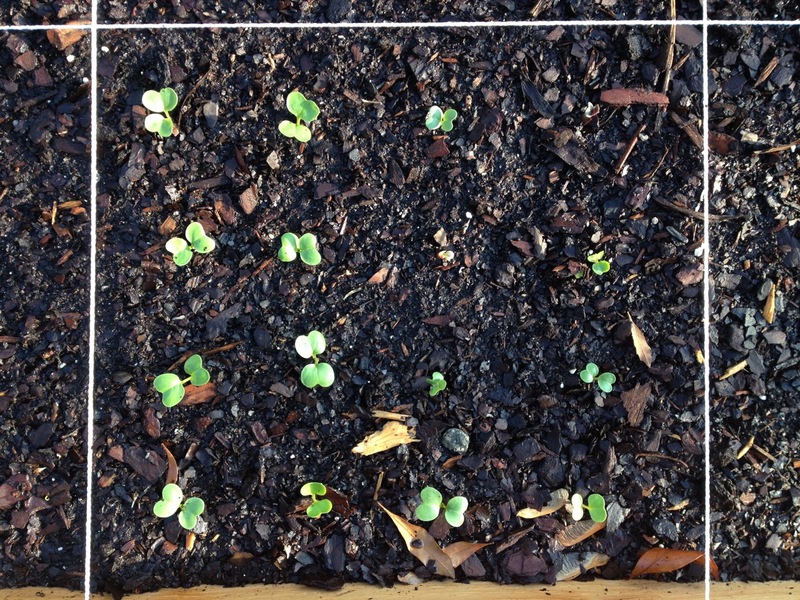 The use of patterns to place the seeds in a square also makes it easy to determine the difference between a vegetable seedling and a weed. Pest control has been limited to organic methods, mainly clipping off leaves with insects and picking off caterpillars and worms from the plants. Harvesting has also been a daily activity. Lettuce harvesting began within the first week with leaf clippings and continued for over two months until all of the lettuce plants were harvested. 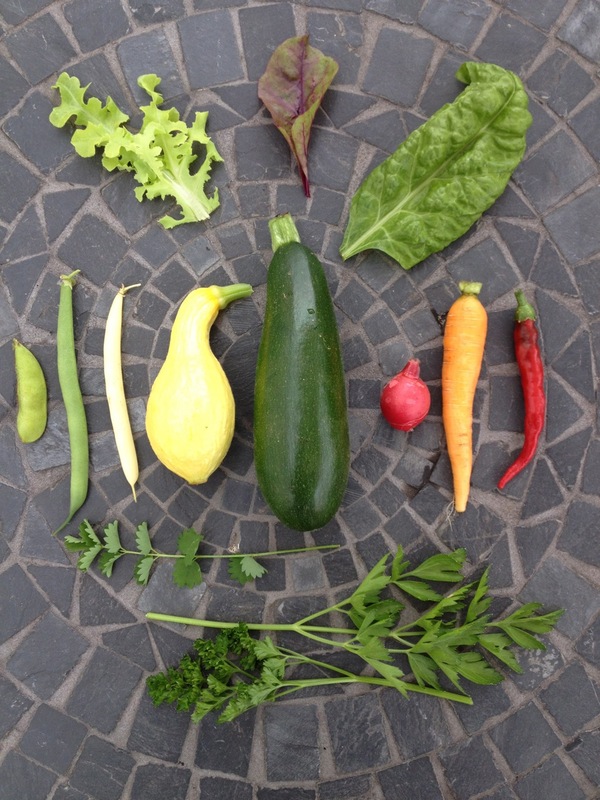 This photo from May 29 shows a sample of each type of food harvested on that single day from the garden. Most of the key observations from last year's garden were not very positive and could actually be considered discouraging for new gardeners. The results and observations so far this year from this new garden show the progress that has been made by applying the learnings from last year. Here are a few of my recent observations. Good soil makes a big difference. Last year I did a poor job of preparing the soil for the first year garden. 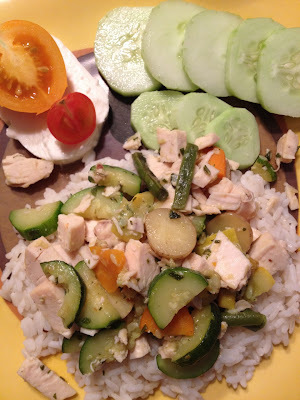 The results included plants that did not grow well, vegetables that did not look that good, and vegetables that did not taste like fresh, homegrown produce should taste. The produce this year in the new garden with good soil has been excellent and the plants have been healthy. Planting in squares -- instead of rows -- helps with planting, yields, and weeding. The Square Foot Gardening methods specifies how many plants of a certain type you can plant in a square: one, four, nine, or sixteen. For example, you can plant one bell pepper plant in a square or sixteen radish seeds in a square. 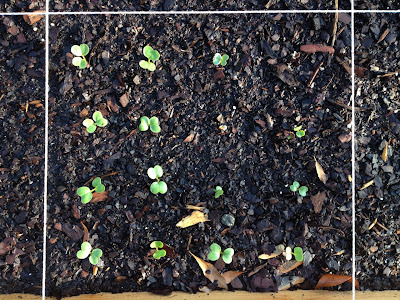 This approach to planting helps with the tracking of plants, keeps the plants close enough to prevent weeds from sprouting, and makes the identification of weeds easier. 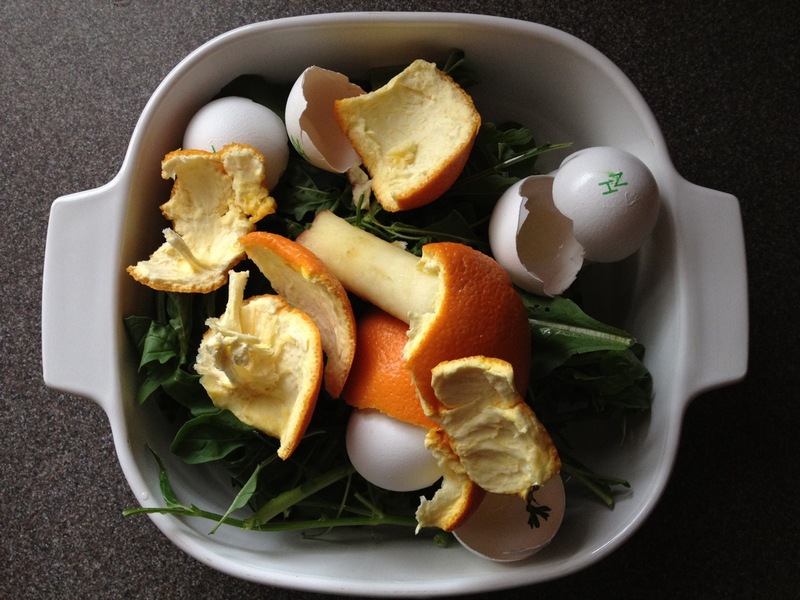 Kitchen scraps are now used for compost. I have been surprised at how much compostable material we had been putting in the garbage disposal or in the trash. 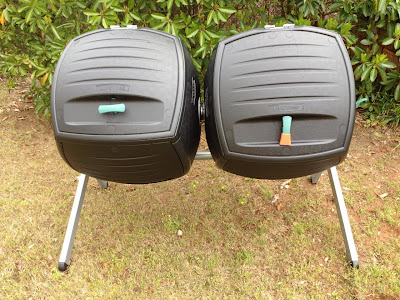 We eat lots of fruit and we like to cook with fresh vegetables, so now apple cores, orange peels, grape stems, egg shells, watermelon rind, and other fruit and vegetable parts are placed in the composter each day. 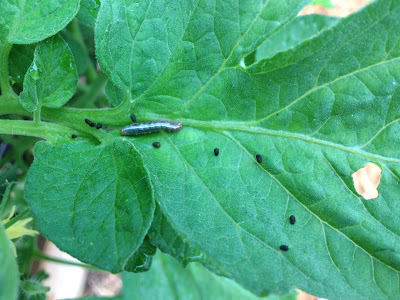 A food garden requires regular maintenance. This is actually a repeat of a key observation from last year. 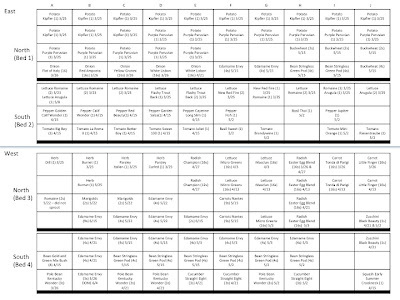 However, it is even more work than I originally thought. 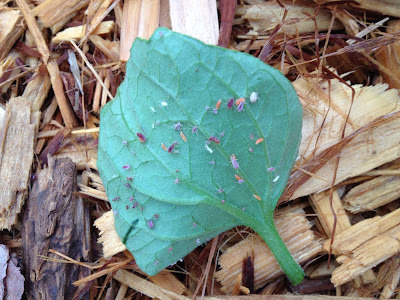 One reason is the new garden is much bigger with many more plants to maintain and harvest. A second reason is I am more knowledgeable about what needs to be done each day. And a third reason is I have let the maintenance go on the first year garden and have seen the result. The picture above is from May of this year. 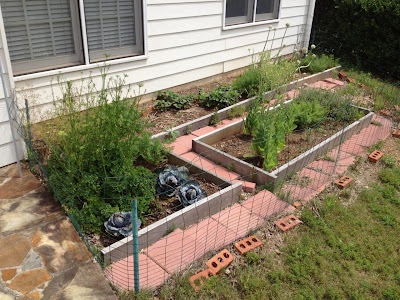 The parsley on the left has grown and flowered, the romaine lettuce on the front right has bolted and flowered, and the onion plants in the back have flowered. Humorous aside: I find the flowering of an onion quite beautiful (see below). I thought it would make a wonderful centerpiece for a table at our wedding reception. 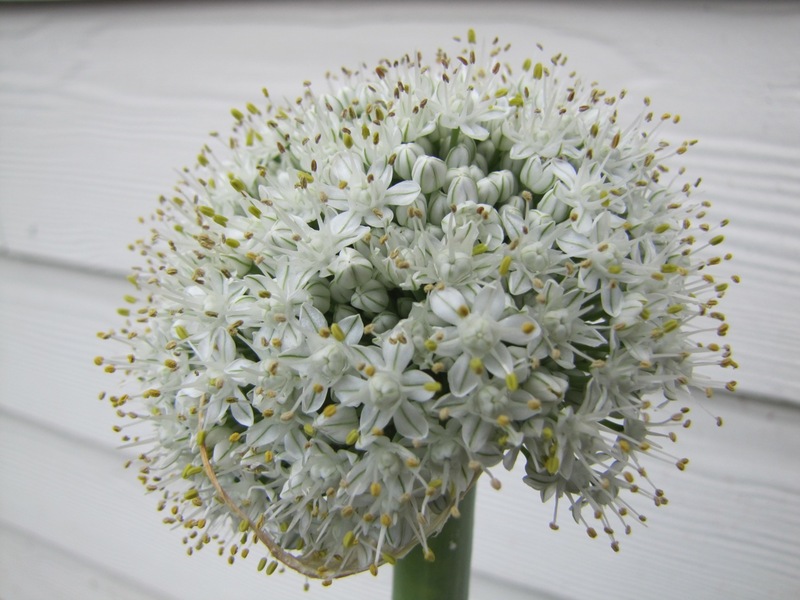 I cut two of these onion flowers and headed with my wife to the reception hall. They did not make it there. The odor of these flowers was so pungent, we stopped the car and left them on the side of the road. 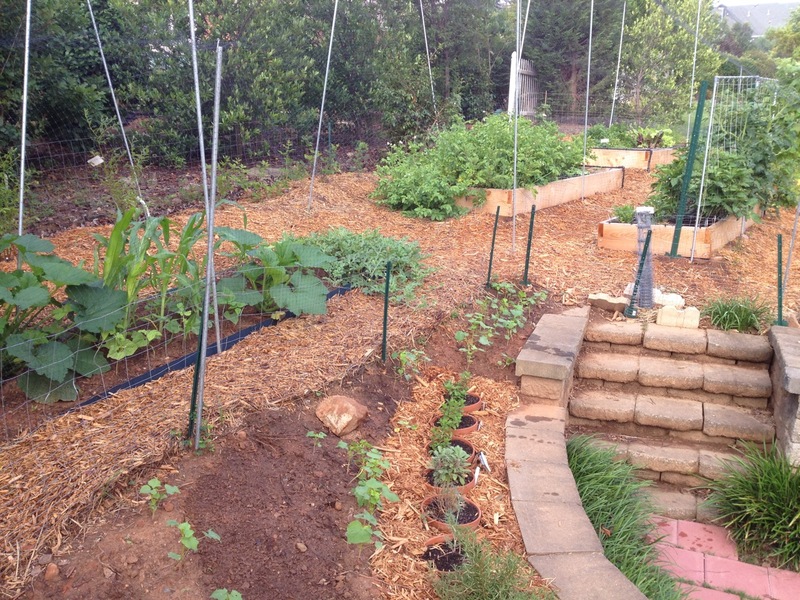 Here is the new garden at the end of May, a little over two months after starting the buildout of the garden. And here are two examples of the many meals we have been enjoying with fresh vegetables from the garden everyday. I will share more observations about food gardening later this year as I learn more.